Parkia biglobosa and Parkia filicoidea are closely related species similar to each other, and the common name African locust bean has been used for both species (USDA, 2017). As the result there is a long-standing confusion between those species, even in the scientific literature. For that reason, this datasheet deals with both species. African locust bean (Parkia biglobosa (Jacq.) G.Don and Parkia filicoidea Welw. ex Oliv.) is a multipurpose tree legume found in many African countries. The seeds, the fruit pulp and the leaves are used to prepare numerous foods and drinks, and to feed livestock and poultry. African locust bean is a medium-sized legume tree that reaches 20-30 m high. It has a dense, widely spreading umbrella-shaped crown and a cylindrical trunk that can reach 130 cm in diameter, often branching low. The bark is longitudinally fissured, scaly between the fissures, thick, ash-grey to greyish-brown in colour. It exudes an amber gum when cut. 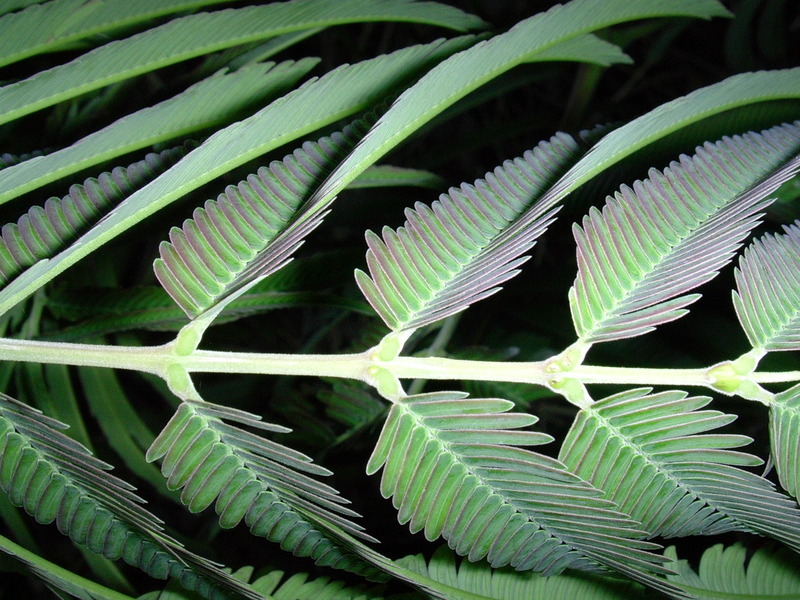 The leaves are alternate and bipinnately compound, 30-40 cm long, bearing up to 17 pairs of pinnae. Its beanets are numerous (13-60/pinna), subopposite, 8-30 mm long x 1.5-10 mm wide, rounded or obtuse at apex, glabrous but slightly ciliate near apex. The inflorescence is held on a long (10-35 cm) drooping peduncle. It is biglobose, showy, red in colour, and it looks like an electric bulb. The flowerhead is 4.5-7 cm long x 3.5-6 cm broad and it has a strong pungent smell. The many flowers are either bisexual, sterile or nectar-bearing. Bisexual flowers are pentamerous, 1-1.4 cm long, and corolla lobes are fused at their base. Sterile flowers are shorter and are borne near the peduncle, in the upper part of the inflorescence, and their nectar is attractive to bats that pollinate the flowers. The flowers begin to open at dusk, close and wilt at dawn, lasting only a single night. The fruit is a linear, glabrous and smooth, indehiscent pod that becomes brown at maturity. It is 12-30 (-35) cm long x 1.5-2.5 cm wide and contains up to 23 seeds embedded in a yellowish mealy pulp. The seeds are globose-ovoid, 5-15 mm, smooth and glossy dark in colour. There are about 2800-6700 seeds/kg. The seeds are hardcoated and can remain viable up to 8 years (Orwa et al., 2009; NRC, 2006; Sina et al., 2002; Hopkins, 1983). African locust bean is a multipurpose tree. The seeds, pods, fruit pulp and leaves are edible and used as cooking or drinking ingredients. The tree is particularly valued for its fermentescible seeds. They are fermented to prepare a condiment that is called "soumbala", "dawadawa", "netetu" or "afinti" that is a strongly pugent as French cheese. This condiment used for sauce and soup seasoning is one of the most important commercial products traded in western Africa. Ground with moringa leaves, the seeds are ingredients for sauces and doughnuts. They can be roasted to make a coffee substitute known as "Sudan coffee". In the mature pod, seeds are surrounded by a quantitatively important mucilaginous pulp which is separated from the seeds when they are collected. This mealy pulp is traditionally consumed as fresh food by local African populations (Campbell-Platt, 1980; Felker, 1981). It makes valuable baby food and is used to make a refreshing drink. The leaves can be boiled, mixed with cereal flour and eaten as vegetable. Flower buds are edible and added to salads (Orwa et al., 2009; Sina et al., 2002). Fruit pulp, foliage and seeds of the African locust bean can be used to feed livestock and poultry. The fruit pulp and the seeds, once processed to remove antinutritional factors, can be included in livestock feed. The leaves provide useful though not very palatable fodder. Their usefulness is increased by the fact that they can be harvested during the dry season when feed is scarce. However, it should be mixed with other feed because their mineral content is too low. The flowers are attractive to bees and a good source of nectar. The African locust bean trees are suitable for beehives. The wood is used in light constructions, poles, mortars, and many kinds of furniture and utensils. It is valuable firewood and provides pulp to make paper. The bark has many traditional uses in ethnomedicine. A root decoction is reported to treat coccidiosis in poultry. Green pods are used as fish poison to catch fish in rivers. African locust bean trees are used as ornamental. They are useful soil improvers and their leaves provide green manure (Sina et al., 2002). African locust bean is native to tropical Africa. It occurs in open savannah woodlands, in bush fallow and wooded farmland where cultivation is semi-permanent, in areas ranging from tropical forests with high and well-distributed rainfall, to arid zones (Orwa et al., 2009; Sina et al., 2002). 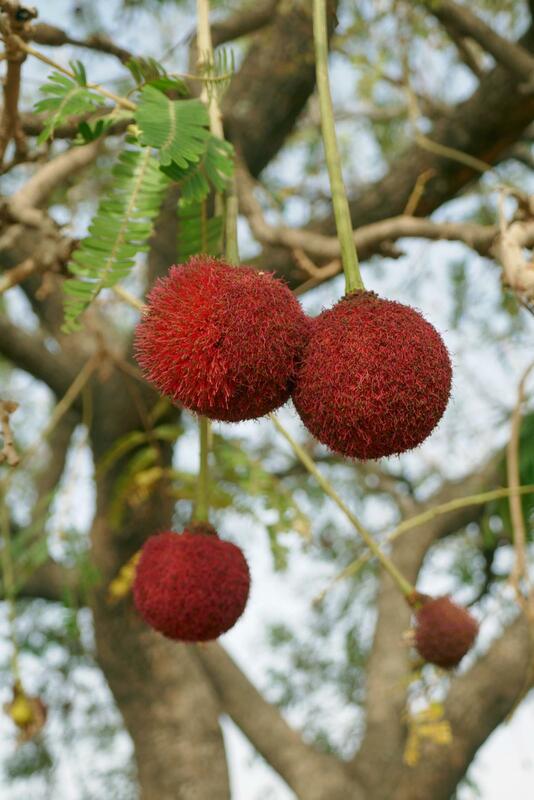 It was introduced as a food plant into the West Indies and is now naturalized in Haiti. It has also been introduced into Sao Tomé by the Portuguese (Hopkins, 1983). African locust bean is found between 5°N and 15°N, from the Atlantic coast in Senegal to southern Sudan and northern Uganda. It grows from sea level up to an altitude of 1350 m and prefers regions where mean annual temperature range is about 26-28°C (Sina et al., 2002). African locust bean grows in areas corresponding to a wide range of annual rainfall with a marked dry season of 5-7 months. In Guinea Bissau, Sierra Leone and Guinea, it grows where average annual rainfall range is between 2200 and 4500 mm. African locust bean can withstand arid zones with less than 400 mm rainfall (Orwa et al., 2009). It is very tolerant of poor soil conditions though it prefers deep well-drained and fertile soils (FAO, 2017; Sina et al., 2002). It can grow on rocky slopes, stony ridges or sandstone hills as well as on shallow lateritic soils (Sina et al., 2002). 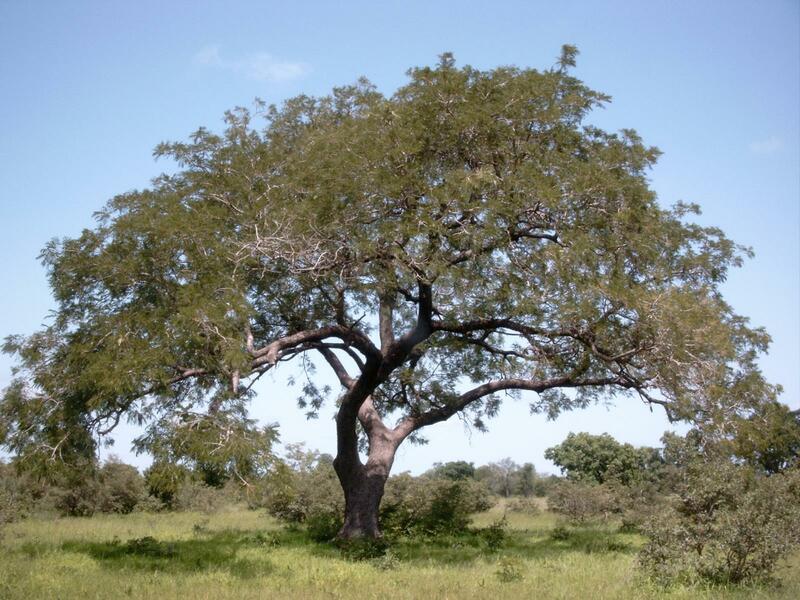 African locust bean trees are deeply taprooted and have the ability to restrict transpiration, which makes them able to withstand drought conditions. African locust bean is a fire-resistant heliophyte (FAO, 2017; Orwa et al., 2009; Sina et al., 2002). 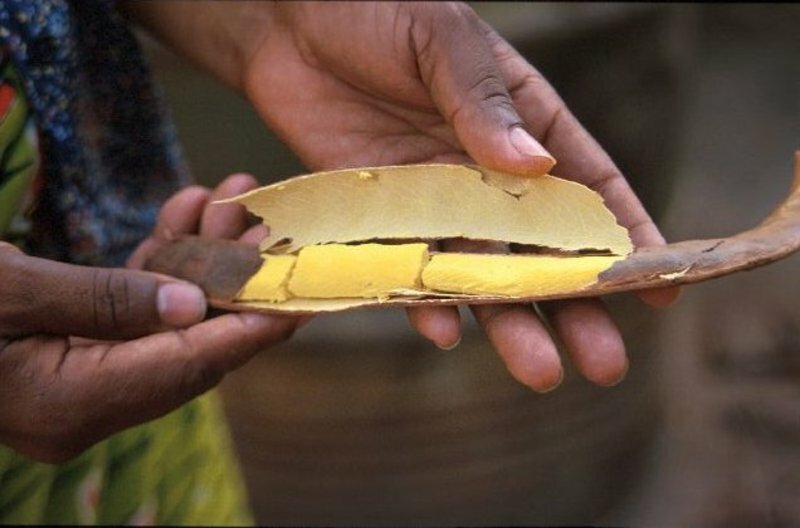 In West Africa, the fermented seeds of African locust bean are commercially traded within the region and their use has been described since the 14th century. 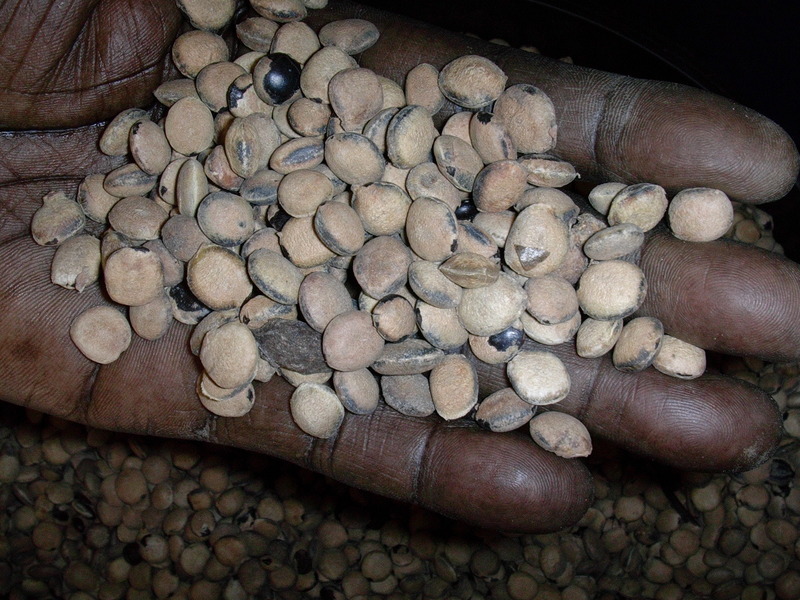 In northern Nigeria the annual production of African locust bean seeds is estimated at 200,000 t (Sina et al., 2002). African locust bean is mainly propagated by seeds. As the seeds are hardcoated, they should be treated with concentrated sulphuric acid and/or soaked in water during 24h prior to sowing. The seeds are generally sown in pots or in seedbeds as they require much attention: watering twice a day and weeding every two weeks. Direct sowing is possible but success rate is low as the strong smell of the seeds is attractive to rodents and other pests. Once the seedlings have reached 20-25 cm high, they can be planted out at 10 m x 10 m intervals. Vegetative propagation is possible. Grafting, cuttings taken from seedlings, and marcotting of 11-25 year old trees showed good results in Burkina Faso and Nigeria (Sina et al., 2002). In the first stages of establishment African locust bean is sensitive to browsing and needs to be protected from livestock (Orwa et al., 2009). African locust bean is a long lived perennial that starts flowering 5-7 years after planting. Flowering occurs during the dry season in the drier places. The tree reaches its maximum height between 30 and 50 years and may live up to 100 years. 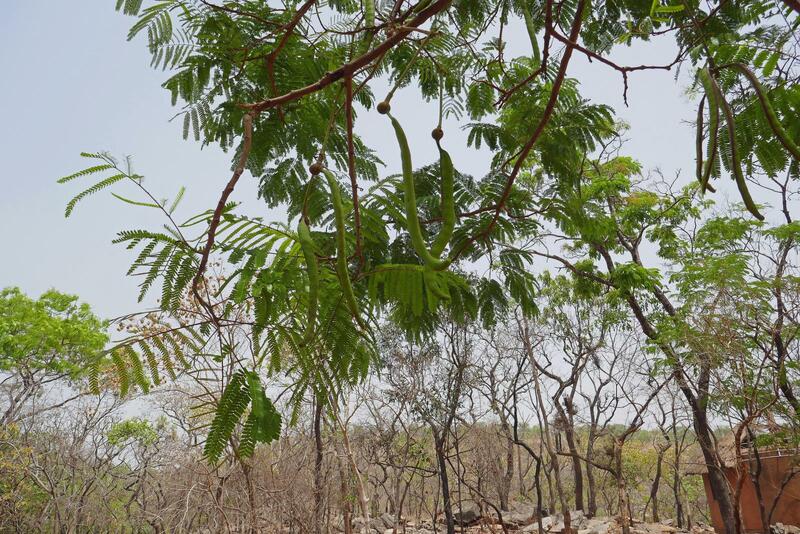 Unlike other trees, African locust bean retains its leaves during the dry season and is thus much valued by farmers who can lop the branches and supplement the low quality forage available to their livestock. Many crops can benefit from being planted under African locust bean canopy: maize, cassava, yams, sorghum and millet (Orwa et al., 2009). African locust bean trees provide shade for forage grasses and livestock. They protect the soil from heat and wind and are potent nutrient cyclers from the deep soil layers. They bind soil particles and therefore have a potential merit in silvopastoral systems. Leafshed provides litter and hence organic matter to the soil. As livestock stands under the trees, they fertilize the soil with their dung (NRC, 2006; Sina et al., 2002; Campbell-Platt, 1980). Parkia spp. foliage is moderately rich in protein (9-18% DM) and very rich in fibre (ADF > 40%) and particularly in lignin (> 20% DM). Its nutritional value is thus limited. Parkia spp. seeds are rich in protein (30% DM) and lipids (17-20%), and poor in fibre (ADF 12%, lignin < 2%). They are a protein and energy ingredient. Parkia spp. 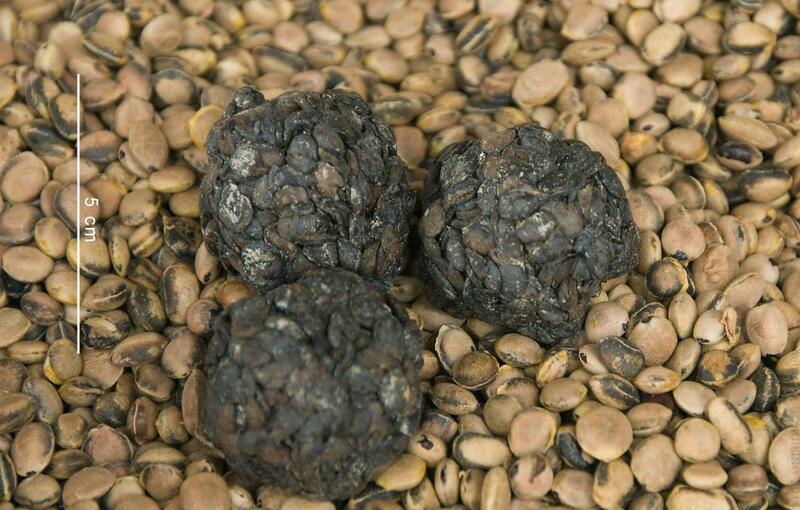 pods are less rich in protein (10-17% DM) and lipids (7-10%) than the seeds, and richer in fibre (ADF 20%, lignin 10%) due to the presence of husks. They are also rich in carbohydrates, mostly sugars and starch (> 50% DM). Parkia spp. pod pulp is poor in protein (3-11% DM) and lipids (<4 % DM), with a moderate fibre fraction (ADF 17%) and a large amount of carbohydrates (sugars > 40% DM). The raw seeds and fruit pulp contain saponins, lectins, tannins and trypsin inhibitors and must be detoxified before being fed to animals (Aregheore, 1998). Detoxification processes typically consist in washing or boiling (Alabi et al., 2005; Esenwah et al., 2008). The role of Parkia filicoidea and Parkia biglobosa as fodder for livestock has long been recognised in the literature (NRC, 2006; Sabiiti et al., 1992), even if this use seems less popular than for human nutrition and medicine (Belem et al., 1996; Sinare et al., 2015). The leaves, seeds, pods and pulp are all used for ruminant feeding. The presence of antinutritional factors may limit palatability. It was suggested that seed extracts, and to a lesser extent leaf extracts may be potential anthelmintic agent in cattle (Soetan et al., 2011). The leaves are traditionally used, and whole branches are lopped for fodder (NRC, 2006). They can be used with success as forage to feed goats and large livestock, generally together with a concentrate (Sabiiti et al., 1992; Okagbare et al., 2004). The potential degradability of African locust bean fodder in cattle, sheep and goats was shown to be among the lowest compared with other typical browse species of Nigeria (Larbi et al., 1997). In particular, Parkia biglobosa leaves had lower in vitro DM digestibility than Gliricidia sepium, which could be attributed to a higher NDF, and probably tannin, contents (Sabiiti et al., 1992). The in vivo OM digestibility of Parkia leaves hay measured in goats was low (32%) (Adeloye et al., 1993). African locust bean leaves included at up to 15% in the diet of Yankasa rams receiving Pennisetum pedicellatum as roughage and a concentrate had no ill-effect on blood parameters of the rams (Wada et al., 2014). African locust bean leaves given as sole forage did not result in live weight gain in West African dwarf female goats, suggesting that this forage would require a supplementation (Adeloye, 1994). Parkia filicoidea hay included as a supplement in a cassava-peel diet and compared to a control diet of Andropogon gayanus, maize and soybean meal, resulted in better DM intake than that obtained with the cassava peels-only supplement or with the control diet. Acceptabilities were enhanced at 25:75 and 50:50 cassava peel:Parkia hay mixtures. Nutrient digestibilities were higher with the 50% replacement diet, except for crude fibre and total ash. The availability of the cassava peel and Parkia hay at little or no cost and the good digestibility of the 50:50 combination would make the 50:50 combination of the plant products an acceptable dry season feed and a suitably cheap feed in subsistence goat-production (Adeloye et al., 1993). The sugary pods are said to be much relished by cattle and other domestic livestock and to provide a valuable dry-season ration. 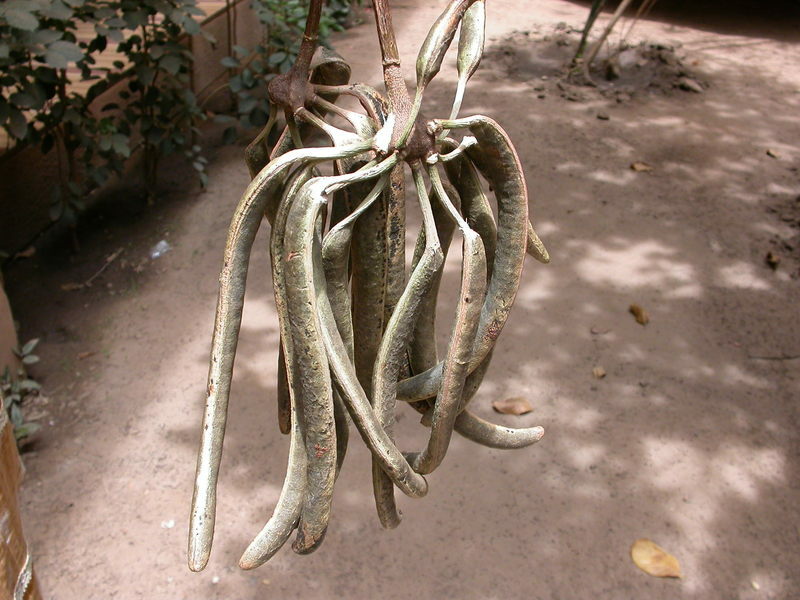 Fresh green pods are traditionally used for livestock feeding in different West African countries (Campbell-Platt, 1980; Felker, 1981; Sabiiti et al., 1992). African locust bean pulp is widely used to feed local dairy cows and other livestock (cattle, sheep, donkeys) in Burkina Faso during the dry season (Amole et al., 2014). In Nigeria, including up to 30% fruit pulp in the diets of rams significantly improved digestibility and nutrient intake (Muhammad et al., 2016). In Northern Nigeria, ground seeds and the sugary pulp of African locust bean are fed to pigs (NRC, 2006). In Ghana, pigs fed isonitrogenous diets containing up to 20% African locust bean pulp showed better performance that those fed the control diet and no major detrimental effects on blood chemistry and carcass characteristics that could be attributed to the inclusion of the pulp (Tengan et al., 2011b). Information on the use of African locust bean products in poultry is limited. In a broiler trial, where Parkia spp. fruit pulp replaced up to 100% maize grain, results indicated that broilers can tolerate up to 25% replacement of maize with Parkia pulp without adverse effect on the performance, haematological and carcass characteristics of the birds (Bot et al., 2013). No specific information (as of 2017) seems available in the international literature on the use of Parkia spp. leaves or green pods in rabbit feeding. Pharmacological studies conducted with rabbits have identified in Parkia leaves anti-diarrhoeal and immuno-stimulating activities (Agunu et al., 2005; Yapo et al., 2010). Since the leaves and pods are widely used for ruminants, they could be considered as potential feed source for rabbits. Young trees (7-8 years old) can be pruned 2 to 4 times a year and provide cut-and-carry forage, which could be valuable for rabbits (Sabiiti et al., 1992). Direct experiments with rabbits would be welcome. African locust bean trees sometimes host the semi-parasite mistletoe (Phragmanthera nigritana or Tapinanthus bangwensis). These potential sources of green forage can be used in rabbit feeding. When compared to Tridax procumbens distributed ad libitum in addition to a concentrate, these two types of mistletoe leaves completely replaced the control forage in rabbit breeding does feeding, without any deleterious effect on their performance or those of their young (Alemede et al., 2013; Alemede et al., 2014). No information seems available in the international literature on the use of this pulp in rabbit feeding (as of 2017). As the pulp is used successfully to feed humans, livestock and poultry, it could be considered a potential source of energy in rabbit feeding but with a lower protein content (5%) than that of cereals. Direct experiments about the inclusion of this pulp in rabbit diets would be welcome, before recommendation of its use. The dried pod husks (24% crude fibre) could also be considered a potential source of fibre in rabbit feeding. Raw African locust bean seeds are very palatable for rabbits and are used in some commercial feeds (mixture of non-ground ingredients) for European pet rabbits (Lowe, 2010). However, this direct utilization remains questionable since some intestinal obstructions in pet rabbits were associated with the ingestion of intact Parkia seeds (Harcourt-Brown, 2007). After grinding, raw African locust bean seeds were introduced, without alteration of performance, in growing rabbits diets at up to 25-26% and so saving some maize and all the groundnut cake of the diet (Balogun et al., 1983; Daniel, 2015). Different treatments of the raw seeds before grinding, such as water extraction, autoclaving (Balogun et al., 1983), boiling, natural fermentation (Daniel, 2015; Akpet et al., 2012), and roasting (Akande, 2015), are able to improve the growing rabbits performance after introduction of the treated seeds at 12 to 25% of the diet. This improvement is generally explained by the reduction of some anti-nutritional compounds contained in the seeds, such as trypsin inhibitors, hydrocyanic acid or tannins (Esenwah et al., 2008; Daniel, 2015). For example, roasted African locust bean seeds (4-5 min at 80°C) were introduced in place of soybean meal and part of the dietary maize, up to 30% of rabbit diets, without significant alteration of dry matter, protein or fibre digestibility (Akande, 2015). The growth rate improvement obtained by using the treated seeds in balanced diets is generally 10 to 20%, in comparison to raw seed utilisation or control diet (Balogun et al., 1983; Akpet et al., 2012; Daniel, 2015). However, any treatment represents an increase of the product cost, in comparison with raw seeds. In addition, treatments imply frequently a reduction of the dry matter mass of the treated seeds, particularly after fermentation. This loss of mass is demonstrated for traditional fermentation by the increase of the content of dry matter in protein (+20%) or ether extract (+30%), and the concomitant decrease of 32% of the total carbohydrates in the fermented seeds, in comparison with raw seeds (Esenwah et al., 2008). Direct experiments would be welcome to assess if the performance increase is sufficient to economically justify the feed ingredients cost increase, knowing that no physiological or health problem is associated with the use of raw African locust bean seeds in rabbit balanced diets. Raw or processed locust bean seeds can be considered a suitable ingredient for rabbits due to their high content in protein and lipids and low fibre content. Proteins are rich in lysine (about 130-135% of growing rabbit requirements), but deficient in sulphur-containing amino acids (less than 70% of requirements) (Hassan et al., 2005; Lebas, 2013). For the lipids, fatty acids composition is characterized by a high level (20%) of behenic acid (C22:0), and close to 50% of linoleic acid with very few linoleic acid (Balogun et al., 1985), a situation which will largely influence the rabbit lipid composition (Lebas, 2007). African locust bean pulp was evaluated as a replacement for maize grain in Clarias gariepinus diets where the pulp replaced maize up to 100%. Performance (weight gain, specific growth rate and protein efficiency ratio) was not affected up to 40% inclusion rate. Economic evaluation of fish produced showed that a 40% inclusion rate reduced production cost by 24% with good fish performance (Sotulu et al., 2010). National Research Council, 2006. Lost Crops of Africa: Volume II: Vegetables. Chapter 11. Locust bean. Washington, DC: The National Academies Press.